Jhonas Enroth – #3 – A Robot must protect the net, except when its protection interferes with the first two laws. Thomas Vanek – #2 – A Robot must obey the orders given to it, except when said orders would interfere with the first law. 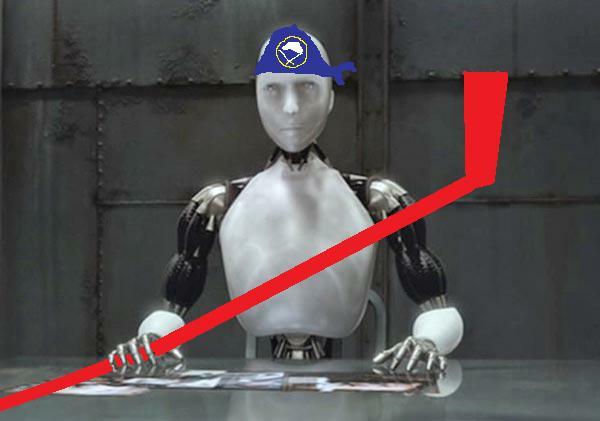 Christian Ehrhoff – #1 – A Robot must screw the Rangers. Steve Ott – #1 – A Sabot must not do too much winning. Brian Flynn – #2 – Encouragement is for pansies. We’ll boo and you’ll like it. Except when it interferes with the first law. Kevin Porter – #3 – Buffalo is Hockey Heaven, except when being Hockey Heaven interferes with the first two laws.